While all my friends were discovering Star Wars and Star Trek when I was a kid, I was busy discovering horror and more specifically cosmic horror in the form of the writings of Howard Philip Lovecraft, or HP to his dear friends. The combination of old time sensibilities and the futility of life in the light of cosmic horror that are so old struck a chord with me which still resonates to this day. It affected deeply the way I look at horror and, for a long time, almost made sure I followed mostly British horror rather than its American cousin, even though Lovecraft was American. It’s no real surprise that when I started roleplaying when I got to college I was attracted to Call of Cthulhu over D&D, even if I had a hard time finding people to play. Over time I discovered the original Arkham Horror and had some fun with that, but while the new edition was sure pretty and had lots of stuff in it, it felt somewhat forced, especially with its long playing time and overly complex rulebook. I was quite curious when I first heard of Elder Sign and could not wait to try it out. I was really happy when it came out on iOS, since it meant I could try it and see just how good it was. The verdict? Well, let’s first look at the game. In Elder Sign (Fantasy Flight Games) by Richard Launius and Kevin Wilson , the players are investigators, trying to find and grab the titular Elder Signs in order to close a gate before one of the Great Old One from the Lovecraftian universe burst through and destroy humanity. They will do this by visiting different locations and complete the various challenges that are present by rolling dice and matching the different symbols. 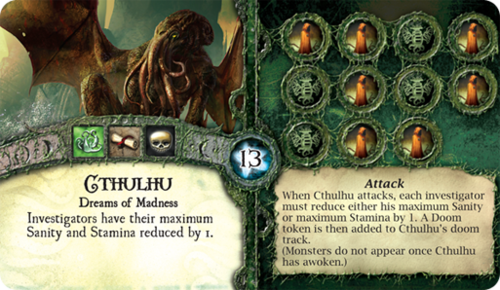 By the clever use of their innate abilities as well as various cards that will confer bonuses, they will get more items and hopefully enough Elder Signs before the Elder God gathers enough Doom tokens and the monstrosity from beyond time and space emerges to destroy everyone. However, they will have to be careful and not take too much damage or go insane, as if they fall in combat, no one will be able to take their place. The Elder Sign Unseen Forces expansion (Fantasy Flight Games) by Richard Launius and Kevin Wilson, brings even more Great Old Ones to the party along with new locations, items and investigators as well as new mechanics, and the main addition of Curses and Blessings which uses two new dice, a black one and a white one. Elder Sign comes in one of the smaller square boxes from Fantasy Flight Games (FFG) and is packed: two packs of different sized cards (small Common Items, Unique Items, Spells, Allies and Mythos cards; oversized Investigators, Ancient Ones, Adventures and Other World cards). 8 Mythos dice (green, yellow and red), a cardboard clock, rulebook and a large batch of tokens. 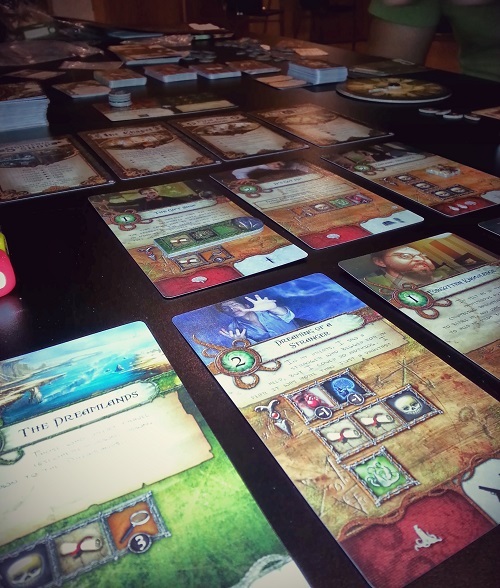 The components are of the usual FFG standard, of superb quality and beautifully illustrated. They are very evocative and will easily lead the players into the 1930’s mythos. The rulebook is maybe one of the better ones from FFG, with tons of clear examples and very well laid out. It is short enough that it is easy to digest and finding rules during a game is pretty easy. Elder Sign Unseen Forces comes with even more cards (both small and oversized) to complement what is in the base box, but add new entrance cards and Blessed and Cursed dice and cards. The quality is indistinguishable from that of the base box and apart from a small logo at the bottom of the new cards, you cannot tell them apart. Another superb job on a Mythos product from FFG. Deal one Investigator to each player and give them the indicated number of Sanity and Stamina tokens. According to the Investigator, hand out random Allies, Common Item, Unique Item or Incantation cards. As such, taking an action is fairly simple: the player simply takes his Investigator token and places it on the Adventure or Other World card he wishes to attempt solving. Before looking at how the Investigator can solve an Adventure card, let’s look at the Investigator card and the dice. There are 5 key pieces of information on each Investigator card: their starting Sanity (beside the blue brain); starting Stamina (beside the red heart); their name (below their portrait); special ability and Starting Items. One of the key element, apart from Stamina and Sanity, is the special ability which is different for each Investigator. These effect range from being able to give back Stamina or Sanity to any Investigator to gaining Common Item, transforming dice face, etc. Use this ability wisely, as it can often make the difference between staying alive/sane and death/insanity. The core of the game centers around the players rolling Mythos dice in an attempt to resolve Adventure (or Other World) cards. The game comes with 8 dice: 6 green, 1 red and 1 yellow. 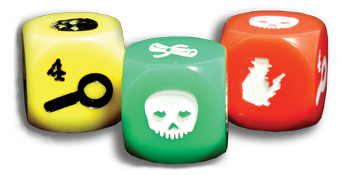 Instead of being the old, reliable 6 sided dice, they have different icons on each of their faces: a magnifying glass with a number from 1 to 3; a skull or Peril; a tentacle or Terror face; and a parchment or Lore. The yellow dice replaces the Terror face with a 4 magnifying glass. The red dice is even better, being like the yellow dice but replacing the 1 magnifying glass with an Investigator face, which is wild and thus can be anything. The yellow and red dice will become available through the use of Common Item, Unique Item or Incantation cards. Adventure cards, or Other World cards, are what will allow the Investigators to gather (hopefully) Elder Signs and ultimately close the gate to our reality, allowing them to triumph over the Great Old One, for now at least. As such, it contains the following information: at the top of the card, right beside its name, is the amount of trophies the card will grant if the Investigator defeats it, which can be used at the Entrance to purchase different cards. Under the description of the card will be any special ability the card can have. Right below that is a series of icons that match the faces of the die. This is what the player must roll in order to defeat the card, but more on this later. At the bottom of the card are what will happen if the Investigator fails to complete the card (in the red section) and what they will gain should they succeed (in the white section). The icons range from a loss of Sanity or Stamina, to the addition of a Doom token (which brings the opening of the gate ever nearer), Elder Signs, Clue token which will allow for re-rolls and various cards that can be gained by the player. Note that it is possible to lose Stamina/Sanity or gain a Doom token even if upon defeating a card! At the end of each Investigator’s turn, the clock advances by 3 hours. When the clock strikes 12 (at the end of a player’s turn or at any other time that has advanced the clock), resolve the bottom part of current Mythos card and draw a new one, resolving the top half of the card. If there are enough Doom token to fill the Great Old One’s track, then play proceeds to the specific endgame for this creature, with the Investigator trying desperately to defeat it in extremis. If they fail, the world is doomed as Cthulhu or one of his cohort breaks through and destroys humanity. Hopefully the reverse happens, in which the players have accumulated enough Elder Signs to close the gate and win the day. Should all Investigators die or go insane, the game is over and all the players lose (and so does humanity, of course). The main new addition in Elder Sign Unseen Forces are the Blessed/Curse die and even there, they are very simple. There is two new icons on some of the Adventure cards, namely one that specify that your character is now either Blessed or Cursed. 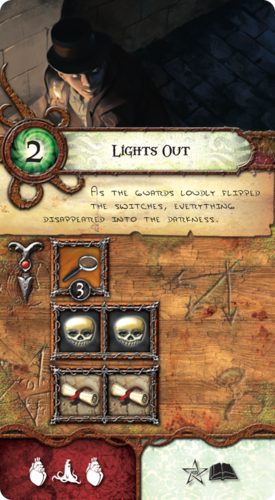 Getting that icon for the first time gives your investigator the use of the white (Blessed) or black (Cursed) die, which either help you by giving you an extra die (Blessed) which works the same as a green die or a “negative” green dice (Cursed) which cancels out any matching face when rolled and cannot be discarded. The Cursed dice is a pain in the neck, as it should be. The players can lose their Blessed or Cursed status by either coming across their opposite or through the effect of a Mythos card. There are a few new icons and functions, such as being able to chose which effect a Mythos card will have, Adventure cards that have effect that are triggered upon entering, modified Entrance cards (now 4 cards instead of 1 and they can be closed due to a Mythos effect), new tasks symbols and new reward/penalties. I love this game. I love the ease of explaining the rules to a new player, the speed at which people pick up the core of the game (yes, it’s an advanced version of Yathzee, so what? ), the tension that’s created when things don’t quite go according to plan, the story it tells. And for one, I love the fact that when playing the base game, your odds of actually beating a Great Old One aren’t, well, great. At their core, a coop game should be about failure. You need to strive against the system and hope that you, as a team, can actually beat the system, else the game has very little appeal. Look at Pandemic, which is extremely hard to beat at first. You need some luck and some good planning before beating it and the same is true of the base Elder Sign. The dice only add to the tension since it is a huge risk element but oh so much fun. So what do you do? Spend one turn to regroup and get an item that should help you? Or throw caution to the win and go for that last Elder Sign? The problem comes with the expansion. I was very excited when I heard about it, especially the new Cursed/Blessed mechanic. It seemed like a very thematic, simple little tweak that could be a lot of fun and it is. It takes no time at all to explain it to players and does add a cool little twist. The problem lies with the revised Entrance cards, at least indirectly. Splitting the old Entrance into 4 cards that can become closed isn’t a problem. It’s the fact that they removed the ability to purchase the Elder Sign from the Entrance. 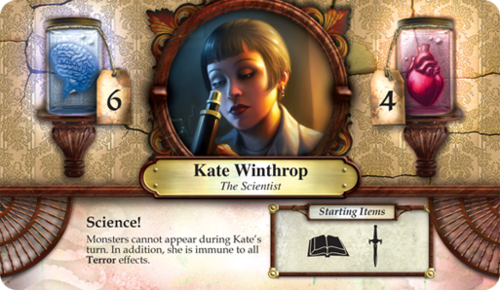 By doing so, they added more Elder Signs to the Adventure cards, making it actually easier to gain Elder Sign. Way easier. I’ve played twice with the expansion and while the Blessing/Curses are cool, the game now is way too easy. We’ve beaten the game without having a single Doom token on the track. Not a single one. Where’s the challenge in that? Sure, there were some times where there was a palpable tension when the dice were about to be thrown, but it was too easy. Should you play with the expansion? Not sure, or if you do, maybe pick and choose which cards you use. I’ve also played a ton of this on the iPad (and bought all the in apps purchases, which I wished they would make for the physical game) and I love it there as well. It’s a nice, single player diversion and it plays fast. Again, the tension is very strong as you make your way and when you manage to beat whichever Elder God who’s in front of you, you do get that unique rush. Elder Sign is a great, casual game that belongs in any collection, whether or not you enjoy ol’ HPL’s writing. It drips with theme, is easy to teach and is a great little coop game. 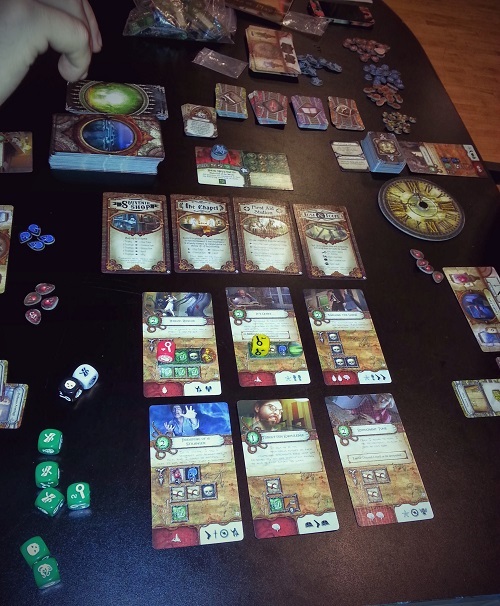 This entry was posted in Review and tagged Elder Sign on November 7, 2013 by TopDog.